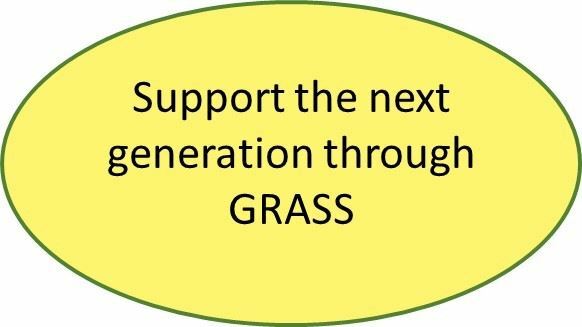 CNGA's newest program, GRASS, began in January 2019. We are awarding competitive research funds to promote undergraduate and graduate student research focused on understanding, preserving, and restoring California’s native grassland ecosystems in accordance with the CNGA Mission and Goals. Download application Information for 2019 Grants. The application period is over for this year. The next application deadline will be January 31, 2020. Check back for more information and an updated application form. Would you like to fund a student scholarship to encourage a new generation of grassland conservationists? Use the form below to donate $500 or more to CNGA and we will offer a scholarship in your name. Or mail a check to CNGA, PO Box 72405, Davis, CA 95472. GRASS Recipients 2018-2019 – First year of program. Edith Lai, UC Berkeley, "Lasthenia gracilis Flowering in Response to Declining Biodiversity in California Grasslands"
Justin Luong, UC Santa Cruz, "WHAT HAPPENS TO RESTORED CALIFORNIA COASTAL PRAIRIES?" We received eleven applications for the 2019 grants. Because we exceeded our goal of $2,000 for 2019, we were able to fund five instead of four students. Thank you to those who donated! We are accepting donations for next years student research scholarships. Our goal for 2020 is to raise $4,000 so we may fund eight research projects! Make your donation below or mail your check to CNGA, PO Box 72405, Davis CA. Or phone 530-902-6009 to pay over the phone.